by marc / Monday, 01 February 2016 / Blog Category: Everything Vegas. The Park is the land in between New York-New York and Monte Carlo that was formerly used exclusively as a conduit to reach the Monte Carlo Porte Cochere and self-park garage. The space still offers this access but will also be a pedestrian area that leads to T-Mobile Arena which will open later in the week. The Park is a good use of space similar to The Linq promenade which used to be an alley between Flamingo and Imperial Palace. 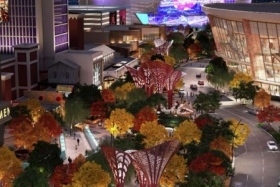 The Park will mainly be a way to walk to the T-Mobile Arena from the Vegas Strip but the area will offer much more than just a pathway. The Park will have places to eat, drink and simply hang out. This is intended to be a place where you can enjoy yourself inside and outdoors. The landscaping will consist of traditional southwest native plants and cooling elements so you can enjoy the area all year around. Mature trees, vegetation, water features and artfully designed shading structures will offer a little respite from the desert sun. The Park will feature patio-style seating which is meant to encourage a genuine social environment. Some of the seating alcoves will be part of large planters will provide areas for relaxation. The Park will also marry the outdoors with the indoors. Many, if not all of the restaurants at The Park will have outdoor seating so you can enjoy the sun, shade and moonlit sky at night. 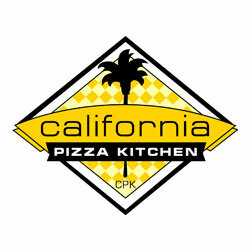 Restaurants at The Park will range from fast-casual to mid-level. This is to say that everything will be affordable. There are no fine dining options planned for The Park. 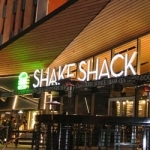 Shake Shack (Already Open) – The much-beloved Shake Shack is considered a modern day “roadside” burger stand known for its all-natural burgers, flat-top dogs, frozen custard, beer, wine and more. The restaurant features a wraparound patio that overlooks either The Park or New York-New York’s Brooklyn Bridge. 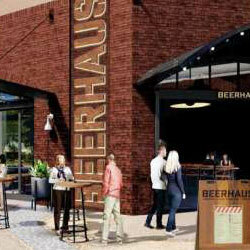 Beerhaus (Details to be released soon) – This is intended to be a fun and unpretentious beer garden, this bar and restaurant will be highlighted by its outdoor spaces and vantage points of all The Park’s activity. 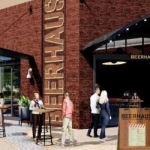 You’ll be able to enjoy in sustainably raised farm-to-table meats, an impressive regional craft brew list, live music and games like bocce ball, darts and outdoor ping pong. California Pizza Kitchen – A new outlet for the mid-level pizza restaurant chain. There’s really nothing more to say. 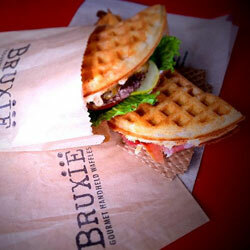 Bruxie – This is a fast-casual, gourmet waffle restaurant born out of Orange County, CA. Bruxie’s breakfast sandwiches use a light, airy authentic Brussels Waffle known as the “Bold Fold.” The Waffle is crisp, lightly yeasty and not sweet – reminiscent of freshly baked bread. I look forward to trying it if only to compare to DuPar’s. More restaurants, such as Dierks Bentley’s Whiskey Row, have been rumored to be opening in the future. T-Mobile Area will have its first concert on April 6. The Theater at Monte Carlo is scheduled to open this winter. The Park has a really nice website with more information and more renderings. The one thing missing from The Park website is information on where to park and how much it will cost. 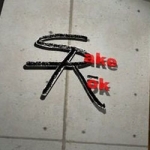 That information will be released shortly before the opening.